question_answer1) How were Harappan seals and sealings used to facilitate long distance communication? What did the sealings convey? question_answer2) Mention any two steps taken by the Mughals to create the revenue as an administrative apparatus. question_answer3) Mention any two arguments given by Balakrishan Sharma for greater power to the Centre. question_answer4) 'The Archaeological records provide no immediate answer to the Harappa's central authority.? Analyze different views given on the same. question_answer5) 'Historians have used a veriety of sources to reconstruct the history of the Mauryan Empire.? Explain. question_answer6) 'The conception of social pollution intrinsic to the caste system, was contrary to the law of nature?. Examine Al-Biruni's statement on Indian caste system. question_answer7) Describe how the 'Humayun Nama' of Gulbdan Begum gives us the glimpses of the Mughal Imperial household. question_answer8) Examine how the Ricardo's idea of land-ownership was introduced in the 'Bombay Deccan'. question_answer9) 'A careful study of census reveals some fascination trends of urbanization in 19th century.' Support the statement with facts. The 77-year-old Gandhiji decided to stake his all in a bid to vindicate his lifelong principle of non-violence, and his conviction that people's hearts could be changed. He moved from the villages of Noakhali in East Bengal (present-day Bangladesh) to the villages of Bihar and then to the riot-torn slums of Calcutta and Delhi, in a heroic effort to stop Hindus and Muslims kill each other, careful everywhere to reassure the minority community. In October 1946, Muslims in East Bengal targeted Hindus. Gandhiji visited the area, toured the villages on foot, and persuaded the local Muslims to guarantee the safety of Hindus. Similarly, in other places such as Delhi he tried to build a spirit of mutual trust and confidence between the two communities. (i) Explain how the spirit of mutual trust and confidence building was initiated by Gandhiji. (ii) Explain the values mentioned in this passage. question_answer11) Discuss how and why were stupas built? 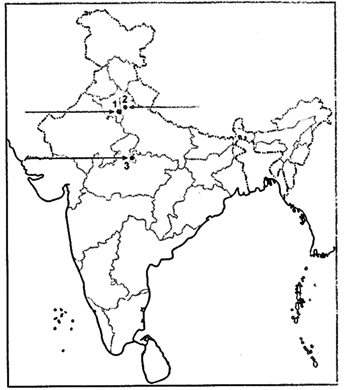 question_answer12) Why was the South-western part of Vijayanagara settlement designated as Royal Centre? Explain. question_answer13) Explain the role played by Zamindars in Mughal India. question_answer14) How did the Constituent Assembly seek to resolve the language controversy? Explain. I have sold to you, on account of the debt due to you, my two carriages having iron axles, with their appurtenances and four bullocks ... I have taken from you on hire under (this) deed the very same two carriages and four bullocks. I shall pay every month the hire thereof at Rupees four a month, and obtain a receipt in your own handwriting. In the absence of a receipt I shall not contend that the hire had been paid. (a) How did the peasants pay back the loan to the moneylender? (b) What NATs the deed of hire? Explain. (c) What light does the deed of hire throw on the relationship between the peasants and the moneylenders? Born in 1754, Colin Mackenzie became famous as an engineer, surveyor and cartographer. In 1815 he was appointed the first Surveyor General of India, a post he held till his death in 1821. He embarked on collecting local histories and surveying historic sites in order to better understand India's past and make governance of the colony easier. He says that 'it struggled long under the miseries of bad management... before the South came under the benign influence of the British government'. By studying Vijayanagara, Mackenzie believed that the East India Company could gain ?much useful information on many of these institutions, laws and customs whose influence still prevails among the various Tribes of Natives forming the general mass of the population to this day?. (a) Who was Colin Mackenzie? Give his introduction. (b) Mention what Mackenzie did to make governance of the colony easier. (c) According to him, what benefits would the East India Company gain after studying Vijayanagara? Explain in brief. These are some of the rules laid down in the Vinaya Pitaka: When a new felt (blanket/rug) has been made by a bhikkhu, it is to be kept for (at least) six years. If after less than six years he should have another new felt (blanket/rug) made, regardless of whether or not he has disposed of the first, then - unless he has been authorised by the bhikkhus - it is to be forfeited and confessed. In case a bhikkhu arriving at a family residence presented with cakes or cooked grain-meal, he may accept two or three bowlfuls if he so desires. If he should accept more than that, it is to be confessed. Having accepted the two or three bowlfuls and having taken them from there, he is to share them among the bhikkhus. This is the proper course here. Should any bhikkhu, having set out bedding in a lodging belonging to the sangha - or having had it set out - and then on departing neither put it away nor have it put away, or should he go without taking leave, it is to be confessed. (a) Name any two Buddhist texts in which the rules for the monks have been laid down. (b) Why were these rules framed? (c) What was the sangha? Explain? (d) State any three rules mentioned in the passage, for the bhikkhus. (ii) On the same map 3 centres of the Revolt of 1857 have been marked as 1, 2 and 3. Identify them and write their names of the lines drawn near them.